"Not letting my stereotypes rise up again, and I will remember to pray for the organizations at work in Houston. Also, I will remember the passion that was re-instilled to teach in the inner-city." "Living life closer to God. Mission trips bring me closer to God and I can do that anytime." "Hearing people’s stories and not judging before I get the whole story, not just what I see." Merry Christmas from your friends at CSM!! It has been over 6 years since I had my first experience with CSM as a Junior at Olivet Nazarene University. Hard to believe! After signing up to be placed on a team, I expected to go on what I thought a typical mission trip...somewhere overseas. I remember being shocked and scared to be placed on the team going to San Francisco, because I knew so little about the city and the issues faced there. However, when the preparation for the trip came I became excited and felt affirmed; I knew I was going on that exact mission trip for a reason but I didn’t know why. What I ended up experiencing in those 5 or 6 short days was what I felt like I’d been searching for at school in finding a major or direction in life– something that I truly felt excited and passionate about. I remember it felt like a door opening– and I wasn’t sure how or why but loving the people I encountered and learning about the issues of the city and the people in it made something click. I still think back to this experience in my life, as it challenges me to tap into that excitement and passion for what I was doing. In approaching my third year in NYC as a CSM director, sometimes I forget that calling that God put on my heart, and the passion that He initially put there. This year has been the most challenging year in many ways, and I am so thankful that God, on several occasions, put me in a place where I was able to get a renewed love for what I’m here for and who I am here to love. Whether it was being able to volunteer at a Saturday site I normally wouldn’t be able to, or meeting new people through sites, my church, and my community, God has been challenging me with a renewed balance of appreciating CSM and the city, and seeing Him at work throughout all of it. I haven’t seen Angel for a few weeks, whenever I pass the intersection he stands at I’m reminded of this lesson God’s been showing me in this wonderful city. Loving someone means being inconvenience for their benefit. It means watching them fall again and again, knowing when to pick them up and when to encourage him/her to get up on their own. It means showing them beautiful things in their world they never knew existed. It means allowing them to grow at their own pace, even when you may want it to go faster. It means being excited when they learn the littlest thing, even when it seems elementary to you. These concepts seem so easy when I am looking at my little one, Elijah. He is this joyful, excited, fresh little spirit exploring his new life. It only makes sense to love him with the amount of grace and selflessness love requires. To be honest, I am selfish with my life. I don’t want to share it with people who are going to clutter it up with their “baggage”. I would prefer putting up boundaries and loving them when it is convenient to me. It’s just easier. But I believe God has given me Elijah as an opportunity to relearn how to love. He is showing me that my life is not mine, but His. That I should receive opportunities to love others as a gift, rather than a burden. This may sound so simple. Many of you may have learned this lesson years ago. I thought I had too. But we all have those people in our lives who have let us down or not lived up to our expectations. The people we love conditionally. And so my prayer for each of us is that God would give us opportunities to relearn what it means to love and that we would be good students. Change.org's Shannon Moriarty reports on a handful of creative Vancouver residents preparing their city for the influx of Olympic visitors. Though many homeless are being displaced because of the games, these individuals are trying to capitalized on the incoming dollars to shape a brighter future for their displaced neighbors. It seems like community is a buzz word these days. I hear so many people talk about I it and I’ve even been a part of “community groups” through church. Talking about it is the easy part, actually building community is another thing altogether. I have recently been challenged to consider how to take our groups to the next level while they are with us. We teach our students about social justice while they are visiting Denver’s low-income communities. I want to motivate students to tackle tough questions and consider how they can do more than just serve a week with CSM. What is the value of community gardens and could they be part of the answer to social justice issues? This is one question CSM Denver groups will be asking and answering this next year. Denver Urban Gardens (DUG) has been instrumental in assisting low income to moderate income neighborhoods in starting and maintaining community gardens. There are over 90 gardens throughout the Denver metro area that DUG either operates or assists. One thing that I really value about DUG is the importance of ownership that they instill in urban communities. And, by beautifying a neighborhood through a garden it gives the community a reason to be proud of where they live and the desire to keep it that way. There are 19 gardens that were started by DUG but do not need assistance anymore because the community is making it happen on their own. True community looks out for the needs of our neighbors. The average household on Food Stamps receives $228 a month. Sometimes it is difficult for families with low income to afford healthy fruits and veggies. My experience from working at a food bank is that inexpensive food is many times unhealthy and even junk food. The option for a family to be part of a community garden means that they have healthy options freely available to them. Community gardening is just one small piece to fighting social justice issues, but the benefits it offers to any neighborhood are definitely worth the effort it takes. Conspire with us this Christmas! Inspired to make a difference this Christmas! Check out CSM's Christmas catalog - gifts to redeem, restore and renew urban centers throughout North America! As I was looking back on the summer here at CSM Philly I felt that there was a void and that we missed something. We had some great groups that learned all about the city, themselves, and how to serve others but there was a richness that was missing. The thing that was missing was Joetta & Roy from Hands of Hope ministry. We have worked with Hands of Hope ministry from the start of CSM Philly in 2002. It has impacted the groups in some deep ways. Hands of Hope Ministry was founded by Joetta and she is and has always been the only employee. Her job is to minister to the people who live on the streets and at times be nothing more than a friend or a hug. The closest thing Hands of Hope has as a second employee is Roy. When I think of Roy my heart fills with joy. Roy lives on the streets and, in my view, is an urban prophet. When the groups serve with Hands of Hope they make bag lunches and travel around the city handing out lunches but more importantly they talk and pray with the folks on the street. Our first stop is always Roy and Roy blows them away. They approach Roy a little scared and hoping he will receive the lunch they have prepared for him but they end up getting more from Roy than they could ever give him. Roy gives them a challenging sermon and blows their stereotypes of homeless people out of the water. 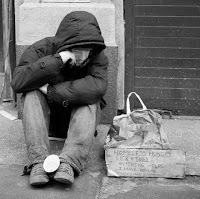 I always get the question “Why is Roy homeless?” and I always say, “I am not sure how he became homeless but I am sure if he really wanted to get off the streets he could but he sees this as a ministry and challenges people’s faith and changes the way they stereotype homeless people. Over the past year Joetta has experienced one hardship after another and was unable to take our groups out to Hand of Hope. Groups missed out on one of the most challenging and impacting ministries that we work with. This past October, we were getting all our tithe appointments together and got cool little gum-ball machines as gifts to give to the volunteer coordinators. To our surprise we were able to get ahold of Joetta and set up a meeting with her. At that point I knew why I worked for CSM and how they care so much for the people in the city. A couple of weeks ago a group got to serve alongside Hands of Hope with Joetta and Roy had a sermon ready for them. Learn how YOU can serve with CSM in Denver or Nashville! From the beginning, Los Angeles was always a city of dreams and wonder. Many people moved to this great metropolis with hopes of bettering their lives: seeking fame, fortune, or just a change of pace. This article is an interesting look at how Skid Row came to be what we know it today. Why it has always been an area known for drifters & vagrants. And why it has recently become an area the city needs to focus on restoring, and not ignoring. Learn how YOU can serve with CSM on Skid Row in Los Angeles! This year we hosted 293 students and leaders through CSM Denver! It was a successful and fruitful year for us and I am continually grateful for the Lord’s faithfulness. He provided time and time again for our needs granting us wonderful groups and leading us to incredible ministry sites. We have currently partnered with over 20 ministries, churches and social service organizations through out the metro area. CSM values relational ministry where our connections continue throughout the years. It has been a joy to begin these relationships this year. I have been blown away by the incredible ministries and people serving Denver. The quality of services given to those in need is exceptional and compassion is overflowing. One of the most encouraging things to me is the amount of people who have worked for their ministry for many, many years. Usually the non profit world sees high turnover, but that isn’t the case here in Denver. Mary has been volunteer coordinator for the Salvation Army for over 15 years, Peter has served breakfast to the homeless for over 10 years, Betsy has been the “interim” director at Broadway Assistance Center for over 12 years and John has been ministering to chronically homeless individuals through a coffee house for over 35 years! These are only a few of the amazing people I have the pleasure of working with and learning from. This year has definitely shown its share of challenges, but the blessings have far out-weighed the trials. I can’t wait to see what 2010 holds for us! Many times, kids on Skid Row are not given the same chances or opportunities as the rest of the nation. But, in the case of Kenneth, he is realizing that with some hard work & the love of some people, he has a chance to make it into college, and from there, the sky's the limit. One of the sites that we are able to work with is called Campus for Human Development. They offer a wonderful program called the Odyssey program that helps men who are living on the street gain a foothold on life including classes to overcome addictions, support, an apartment, job, and, the part we help with, Monday night family dinners. Throughout the year, this program has been giving back to their community. They have spent time “to get down and dirty” as they “reach outside [themselves] and into the community.” These outreaches include volunteering as crossing guards at Nashville’s Walk In Their Shoes. They spent time making care bags full of toiletries for a neighborhood town that was hit by tornadoes. A group of 15 traveled to Second Harvest Food Bank to spend hours sorting frozen food that will be handed out to those in need in the community. Lastly, some of the Odyssey men traveled to a local retreat center where they pulled weeds, tackled yard work, and sorted recyclables. You always hear the phrase “it’s better to give than to receive,” but this story helps me realize that in a whole new way. The Odyssey program is somewhere that the students that come serve in Nashville go to give of themselves. However, when we serve others, we can forget the gifts, talents, and abilities that they have to give because we are focused on our own service. This group of men and their story helped me to remember that all people have worth and the ability to give. Shane Claiborne recently published an article called "What If Jesus Meant All That Stuff?" in Esquire Magazine. That's right. Esquire. Funny pairing you may think? Shane is a member of the Christian Community Development Association, author of Irresistible Revolution, Jesus for President and many other gripping books encouraging today's church to think differently about how Jesus calls us to live. Esquire is a men's magazine, has received award after award over the years and is a pop culture icon. The combination seems kind of hilarious. And awesome.